Having previously built a website for Hook and Ladder’s parent company, cafehome.com, we were delighted to be asked to build a new ecommerce site for this new brand based in Waterford. 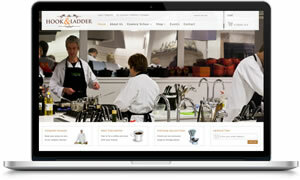 With the opening of its new Waterford Cookery School in September 2013, Hook & Ladder wanted a fully functioning ecommerce site that could handle course bookings aswell as provide a platform to showcase and sell its exciting range of exclusive giftware, furniture and home accessories. The site, built in WordPress, has a number of features to help enhance customer engagement and conversion and is fully integrated with the Realex payment gateway, allowing credit and debit card payments to be taken directly on the site.